The way in which the house-building market operates constrains the supply of new homes, because there is insufficient competition and innovation. We want to diversify the market to achieve the amount, quality and choice of housing that people want. This includes supporting new and different providers, more innovation in methods of construction, and supporting new investors into residential development. boost productivity and innovation by encouraging modern methods of construction in house building. 3.1 The housing market needs to operate differently if we are to start to address affordability issues and deliver the step change in house building that is required. 3.2 There is a lack of competition. We increasingly depend on the major house builders to build most housing. Smaller firms bore the brunt of the recession and their output still falls far short of pre-recession levels. Other parts of the market have the potential to grow. Housing associations build around a third of all new homes but could build more with the right ambition and support. Investment in building homes for private rent is increasing, but we have an opportunity to go much further to drive up supply. Custom built homes remain a niche product and are underexploited compared to many other countries. 3.3 The business model for many commercial developers limits the number of homes that are built. The 2007 recession reinforced cautious behaviours at all stages of the house-building process. Major builders rely on sub-contracting, which pushes innovation and risk down the supply chain to those least equipped to respond. 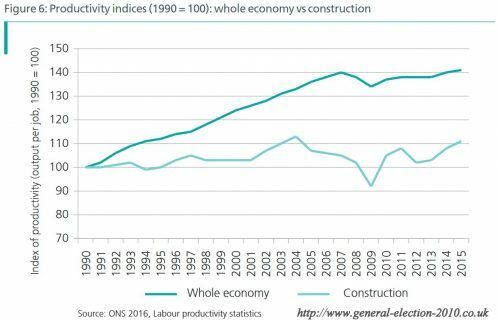 House-building methods have barely changed in over 100 years; productivity in the construction sector is lower than most other sectors of the economy. 3.4 The Government therefore proposes to support different parts of the market, including new entrants, to help boost productivity and innovation. 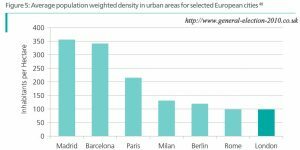 This should help to support a more diverse and vibrant market that is more responsive to demand and gets more homes built. We want to ensure that new homes are built to a good standard, are energy efficient and so reduce fuel bills for home owners, and are accessible, sustainable and secure. We will also identify what more can be done to reduce delays and fees resulting from conveyancing to help ensure the market works better for home buyers. 3.5 Small builders have been declining and were hit hard by the recession. 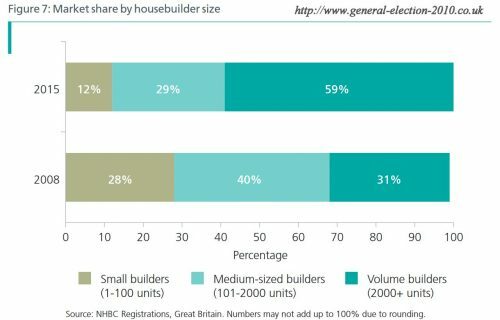 The number of homes registered by small builders is down from 44,000 in 2007 to 18,000 in 2015 demonstrating the potential for growth. 3.6 The Government will help this sector to grow and develop again. Small and medium-sized house-builders regularly cite land, planning and finance as the major barriers to expansion. in principle will remove some of the uncertainty for smaller builders when considering land options. Chapter 1 sets out our proposals to go further and bring more small sites forward for development that are more easily accessed by these firms. In light of these proposals, and to minimise the burdens on local authorities, we have decided not to introduce a requirement for local authorities to keep a small sites register at this time, following the consultation last year. 3.8 The Government launched the £3 billion Home Building Fund on 3 October 2016, and continues the Housing Growth Partnership with Lloyds Banking Group. The Home Building Fund will provide £1 billion of short-term loan finance targeted at SMEs, custom-builders and innovators to deliver up to 25,000 homes this parliament; and a further £2 billion of long-term loan funding for infrastructure and large sites, unlocking up to 200,000 homes. 3.9 Our new Accelerated Construction programme will support us in diversifying the market through partnering with small and medium-sized firms and others as development partners and contractors. We will continue to work with the British Business Bank to encourage current and potential lenders and investors to invest in SMEs. We will publicise our Help to Buy equity loan scheme to small and medium-sized builders to encourage uptake. Source: NHBC Registrations, Great Britain. Numbers may not add up to 100% due to rounding. Latis is an ambitious SME aiming to become a major player in the house-building market. The Government has supported two of Latis’s projects. Conduit Lane in Hoddesdon, Hertfordshire, consists of the refurbishment of a Grade II listed building, alongside the construction of a new-build block of apartments to the rear of the site. The project had started on site but, due to lack of funding, was stalled. Latis sought funding from the Government. We are providing a loan of £4.6 million and, as a direct result, Latis will deliver 43 new homes and two retail units. At the time of completing the Conduit Lane transaction, Latis was preparing another much larger project at the Kitchener Barracks site in Chatham, Kent, consisting of 267 units plus commercial space. Traditional lenders were again unwilling to support the project, but this was the landmark site that Latis needed to act as a launch pad for its growth plans. The Government has offered a loan of £14.4 million on the scheme. This will help Latis achieve its ambitions for growth and get homes built where this otherwise would not happen. 3.10 The Government is taking direct action through the Accelerated Construction programme. We will help diversify the house-building sector and see homes built quickly by partnering with small and medium-sized builders, contractors and others to build out surplus public sector land. generate higher receipts for the taxpayer through sharing risk and reward in the development of our land. 3.12 Through this programme, the Government will work harder to make public land available and ready to build on. Alongside land from central government, we will work with local authorities to help them bring forward their own sites. The Government will partner directly with innovative private sector partners. Through sharing risk and reward, we will lower developer risk and help overcome issues with access to finance and build out sites up to twice the rate a large developer might. We will also support the development of modern methods of construction, generating the confidence for the private sector to invest in new capacity. In doing so, we will aim to bring forward as many genuinely additional homes as possible. 3.13 For all sites, we will consider the most appropriate development route based on the appetite of those we partner with, the characteristics of the site (including its size and viability), and requirement for enabling works, such as land remediation or basic infrastructure provision. Sites will be tendered individually, or as part of a portfolio of sites to spread risk, providing the confidence to invest, and obtain best value for the taxpayer. Where appropriate, we will obtain or provide ourselves with outline permission and undertake the costs of some remediation work to reduce development risks. 3.14 Alongside smaller firms, the Government wants to support the growth of custom built homes. These enable people to choose the design and layout of their home, while a developer finds the site, secures planning permission and builds the property. Custom built homes are generally built more quickly and to a higher quality than other homes, and tend to use more productive, modern methods of construction. They present a less risky business model for builders, as the house has been effectively sold before it has been built. Fewer homes are custom built in England than many other countries, but there is evidence of more demand for them including from older people. 3.15 The main barriers to custom built homes are access to land and finance. Mortgages for custom and self-built homes represent a very small proportion of the overall lending market. We have already taken steps to improve access to land. The new ‘Right to Build’ requires local planning authorities to find land for those seeking a custom built home in their area, and they must keep a register of those wanting to build their own home. And the Home Building Fund will help custom build firms. work with lenders to ensure they have plans in place to increase their lending in line with consumer demand. We are delighted that Virgin Money plans to start lending on custom build projects in the summer. 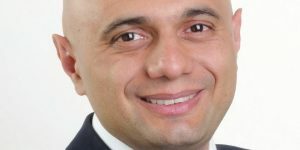 The Government loaned £291,000 to help a local small developer, Westward (UK) Ltd, to prepare 18 plots specifically for custom build in French Fields, a derelict industrial site close to St Helens. Working with a specialist custom-build housing supplier, Pottons, and mortgage brokers BuildStore, Westward has put all the services into the site and obtained outline planning permission from the local authority. 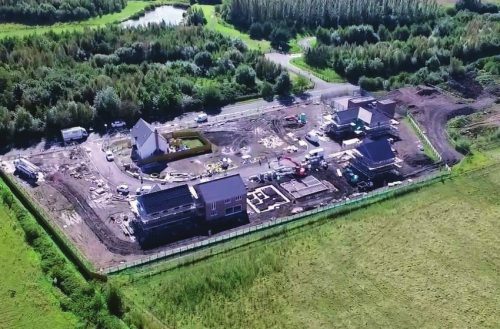 The resulting 18 ‘shovel ready’ sites have all been sold, and 5 homes are already being built on the site the way that their owners want them. We hope to support many more schemes like French Fields through the Home Building Fund. 3.17 The Government also welcomes the establishment of the Right to Build Taskforce by the National Custom and Self Build Association. 3.18 If we do not believe local authorities are taking sufficient action to promote opportunities for custom-building and self-building, we will consider taking further action including possible changes to legislation. 3.19 We need to support other parts of the market to deliver the step change in house building that is required. We want institutional investors to invest more widely in housing, including shared ownership. Pension schemes are increasingly regarding housing as an appropriate investment. The pooling of local government pension funds will increase opportunities for their assets to be used to support infrastructure projects, including housing. This could generate promising returns for scheme members while maintaining value for money for national and local taxpayers. 3.20 Alongside affordable homes, we need more good quality privately rented homes. This sector has doubled over the last decade but rising rents suggest that demand is still growing. Following the 2012 review of barriers to institutional investment in the private rented sector, the government’s Private Rented Sector Task Force made major early in-roads to establish the “Build to Rent” model in the UK, and to stimulate initial investor interest. The Government has supported this through the £3.5 billion Private Rented Sector Housing Guarantee Scheme, and the £1bn Build to Rent Fund. 3.21 We want to build on this and attract major institutional investment in new large-scale housing which is purpose-built for market rent. This will drive up overall housing supply, and increase choice and standards for people living in privately rented homes. These developments tend to be built out more quickly, adopt modern methods of construction and help regenerate local economies by attracting a skilled labour force. 3.22 Purpose-built market rent also has the potential to help provide more stable rented accommodation for families. As access to ownership has become more challenging, increasing numbers of families with children are making their home in the private rented sector. The proportion of households in the private rented sector with dependent children has increased from 29% in 2003-04 to 37% in 2014-2015. We are therefore keen to see more family-friendly tenancies in new build private rented sector schemes. ensure that family-friendly tenancies of three or more years are available for those tenants that want them on schemes that benefit from our changes. We are working with the British Property Federation and National Housing Federation to consolidate this approach across the sector. This project, developed by Essential Living, is being constructed using offsite modular construction. It will comprise 249 apartments in two towers, one of which will be exclusively for families and features an on-site nursery. As part of the arrangements with the London Borough of Greenwich, a quarter of the homes will be available at discounted market rents, at 55%, 65% and 75% of market rent. These homes will be spread across the development to create a balanced community living in a tenure-blind development. 3.24 Housing associations have a vital role to play if we are to build the homes we need. They already build the vast majority of new affordable homes, in addition to increasing numbers of homes for market rent and sale. Investment in affordable housing is a tried and tested way of getting new homes built, and it is normally more resilient than market house-building to changing housing market conditions. 193,000 homes were built under our 2011–15 Affordable Homes Programme – exceeding its target by 23,000. Building new affordable homes also helps kick start other house-building, as it can help make sites viable and bring in investment. 3.25 The Government launched the Affordable Homes Programme for 2016–21 last year, and announced at Autumn Statement new funding and greater flexibility so that it now funds a range of affordable homes for rent as well as home ownership. Further details are in chapter 4. Alongside this, the Affordable Housing Guarantee Scheme has enabled housing associations to raise finance from both the debt capital markets to support the building of over 28,000 new affordable homes. set out, in due course, a rent policy for social housing landlords (housing associations and local authority landlords) for the period beyond 2020 to help them to borrow against future income, and will undertake further discussions with the sector before doing so. L&Q is a housing association and a leading residential developer. It merged with East Thames housing association last year and now has more than 74,000 homes across London and the South East. Alongside the merger, L&Q committed to a vision of creating 100,000 new homes across a range of tenures. To support this ambition, L&Q is shifting its focus towards strategic land deals that will give it greater access to larger sites, with more control over the speed of delivery. 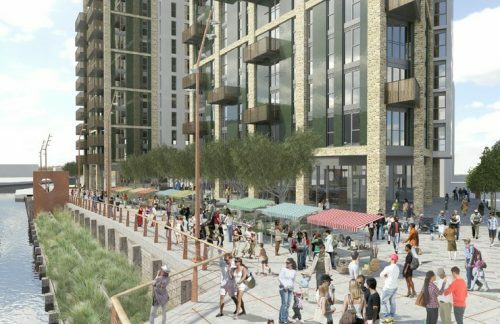 An example is Barking Riverside in East London, where L&Q is helping to create a community of 10,800 new homes. L&Q recently completed the acquisition of Gallagher Estates, in a deal that will give it control of plots to deliver 42,500 new homes in the south of England and south Midlands. expect housing associations to make every effort to improve their efficiency, in order to release additional resources for house-building. In some cases, housing associations will be able to drive efficiency through mergers or partnerships with other associations. We welcome the efforts being made by some in the sector to create a single set of metrics to make it easier to compare housing associations’ efficiency. We expect the sector to implement this agenda and deliver measurable improvements in efficiency. 3.27 Local authorities’ role in delivering new housing goes beyond using their planning powers. They also have an important role in delivering homes themselves. 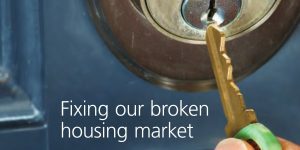 We want to make sure that they have the tools they need to get homes built where the market isn’t coming forward with enough. 3.28 Increasingly and across the country local authorities are using innovative new models to get homes built in their area. There are a number of good examples of Local Development Corporations, local housing companies and/or joint venture models building mixed sites, which include new market housing for sale or private rent, as well as affordable housing. We welcome innovations like these, and want more local authorities to get building. To that end we will seek to address the issues that hold them back. However, we want to see tenants that local authorities place in new affordable properties offered equivalent terms to those in council housing, including a right to buy their home. 3.29 Support is already available to give local authorities access to the right skills and capacity when needed. This includes our Garden Towns and Villages programme, the Planning Advisory Service, and estates regeneration funding. The Government will ensure these funds support the priorities set out in this White Paper and consider whether additional support – for instance commercial and financial experts working on the ground – is necessary. 3.30 We are offering tailored support packages to councils who want to build on their own land at pace, through our new Accelerated Construction programme. As stated in chapter 1, we have also announced a new £45m Local Authority Land Release fund for land remediation and small-scale infrastructure, with priority given to innovative delivery models as well as areas of high housing need. Chapter 2 also sets out the range of measures we want to put in place to better equip local authorities to get homes built. 3.31 Alongside new delivery models, there has been a long tradition of council housebuilding. This continues to provide a small, but important and growing source of new homes. Twice as many council homes were built in England in the last five years than were from 1997 to 2010. 3.32 We will work with local authorities to understand all the options for increasing the supply of affordable housing. 3.33 Housing markets are different right across the country, and we are interested in the scope for bespoke housing deals with authorities in high demand areas, which have a genuine ambition to build. We will look seriously at any request from local authorities for Government powers to be used to support delivery in their local area, and will be prepared to consider all the levers at our disposal to do so, so long as this results in genuinely additional housing being delivered. Through these deals we will also look to promote the alignment of decisions on infrastructure and housing at higher spatial levels, including through joint local planning and statutory spatial plans. This includes the powers of the Homes and Communities Agency, support from the HCA on the use of Compulsory Purchase Orders, new permission in principle and brownfield registers, the use of the planning freedom powers taken in the Housing and Planning Act, and use of public sector land. 3.34 Together with other measures in this White Paper – the increases in planning fees, strengthened tools to drive build out and land assembly powers, our new Housing Infrastructure Fund and place-based approach to delivery – this will give local authorities the tools they need to get building. 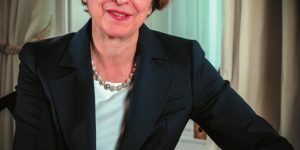 3.35 Earlier this year, the Department for Communities and Local Government carried out a comprehensive Tailored Review of the Homes and Communities Agency (HCA), the Government’s housing delivery body. It concluded that the HCA continues to have a central role to play in delivering more homes across the country but needs to do more to increase the scale and pace of house-building. To respond to the housing challenge, the HCA should do some things differently by getting homes built directly on public sector land, encouraging more competition and embracing partnerships, working innovatively with local and combined authorities, LEPs and other partners. 3.36 This summer, therefore, the Homes and Communities Agency will be relaunched as Homes England with a clear, unifying purpose: ‘To make a home within reach for everyone’. At the heart of this renewed purpose will be the ambition to get more homes for communities across all housing tenures, put in infrastructure to unlock housing capacity and attract small builders and new players to diversify the market on a sustainable basis. 3.37 The housebuilding industry is less productive than the wider economy, partly because it has been slow to modernise and make use of more efficient and faster ways of building. By increasing innovation and making greater use of modern methods of construction we can change this. 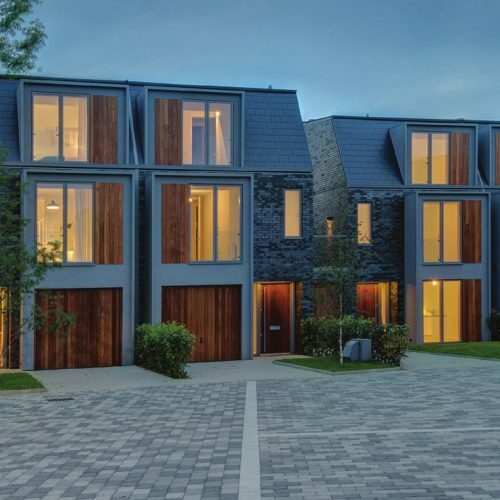 Industry reports suggest homes constructed offsite can be built up to 30% more quickly than traditional methods and with a potential 25% reduction in costs. They are high quality, reliable, more productive and can be highly energy efficient. They are high quality, reliable, more productive and can be highly energy efficient. They can require fewer people on site, helping to mitigate the skills shortage. Some firms are increasing their use of these methods, but we need to go further. 3.38 The industry has the potential to expand significantly, but a lack of demand from house-builders means that large firms tend to focus on manufacturing hotels, student accommodation and schools. Firms have told us that the most significant barrier to growth is the lack of a pipeline. A forward view of future orders and more information about the land available for development would allow them to secure investment to scale up production. International evidence suggests that as production increases the cost per unit falls.62 Scaling up production would allow industry to explore and deliver efficiencies, driving down costs. In turn this will encourage more builders to use these methods as it becomes economically sensible for them to do so. 3.39 To underpin the growth of this sector we must ensure that homes built offsite can access finance on the same basis as traditionally built homes. The Buildoffsite Property Assurance Scheme, which provides assurance to lenders on methods of construction, has existed for some time but there is limited take-up among lenders, partly because of a lack of data to support them in making decisions. alongside the Home Building Fund, consider the opportunities for offsite firms to access innovation and growth funding and support for them to grow. 51 ONS 2016, Labour productivity statistics, output per hour worked. 52 These figures relate to the number of registrations received by NHBC and therefore do not reflect all housebuilding firms. A builder is required to register a home with NHBC at least 21 days before building starts. After registration, builders may decide not to build on a particular plot. Small builders are defined here as firms registering between 1 and 100 units. 53 According to successive Ipsos MORI polls, more than a million people across the UK expect to buy a building plot, secure planning permission or start/complete construction work on their new home; PlotSearch has more than 100,000 live subscribers; and Rightmove has an average 400,000 monthly searches on land. 54 In 2016, lending on custom and self build projects totalled less than £1 billion compared to £10 billion in mortgage lending in just one month overall (figures drawn from BuildStore and the Council of Mortgage Lenders). 55 This will also continue to apply for extensions and residential annexes. 57 DCLG Affordable Housing Supply, 2014-15 (02 December 2015); Affordable housing starts and completions funded by the HCA and GLA, 2014/15 (03 December 2015). 61 Modern methods of construction include homes that are built offsite or can be rapidly assembled or use other building techniques that increase productivity. 62 Davies G (2013) Design for Manufacture and Assembly is helping revolutionise construction, making it faster, cleaner, cheaper and more reliable. Engineering Excellence Journal (Laing O’Rourke). And Woetzel J, Ram S, Mischke J, Garemo N and Sankhe S (2014) A blueprint for addressing the global affordable housing challenge. McKinsey Global Institute.